This is a lovely looking 18k. 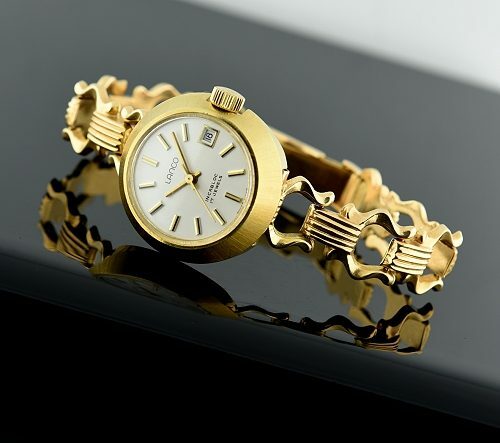 solid gold vintage LANCO 1960’s ladies watch. The intricate 18k. solid gold signed bracelet will fit a 6.5 inch wrist. The case is 18k. solid gold with a stainless steel case back. The manual winding movement was barely used in the past-sparkling and accurate after a recent cleaning. We purchased this watch from the original owner who says she really NEVER wore the watch-it sat in safety deposit. The solid gold head is a good size at 25.3mm.-easy to read. Being 18k. including the bracelet, this is AMAZING value at only $995.